L & M Seanart ORIGINAL. 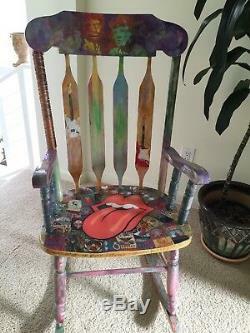 "Rolling Stones Rocker" One of a Kind Rocking Chair. 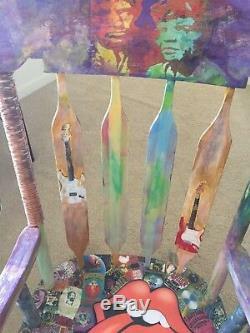 Another beautiful, one of a kind creation by L&M Seanart! 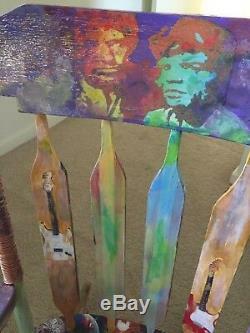 This chair was out on the curb and no longer desired, their hearts set and focused to give it new fire. 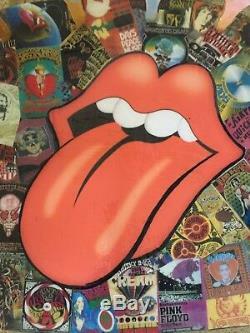 50 years old with a brand new swagger, totally in tune with the Stones & Jagger. 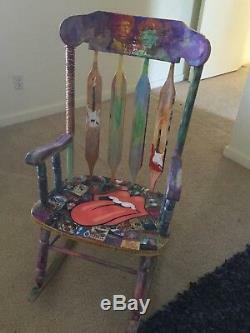 If you are a Rolling Stones Die Hard Fan (or love someone who is), not sure how you can live without this beauty! Dimesions approximately 24" wide x 30 1/2" wide x 43 tall. 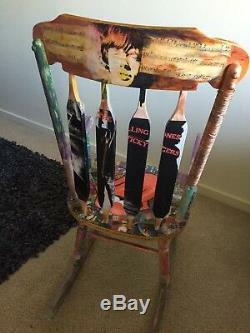 Laura is the furniture Art Maven and we will be listing some more of her repurposed creations soon! Thanks for looking, we welcome any questions and always appreciate your business! 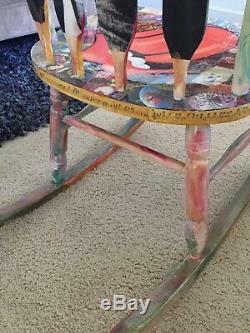 Please continue to visit our store for more "one of a kind" pieces by these fantastic Southern, CA artists. Laura Levi-Sean & Michael Sean. Laura & Michael have been together 3 years. The art we are showing are collaborations, two souls coming together who met on an Island, married quickly and have been creating art with love and passion ever since. Though vastly different in artistic styles, through a melding of conceived ideas, working as one without restrictions we are able to create freely. We offer our art with no fear of judgment. We only hope to evoke emotion. Laura has always enjoyed art, decorating & design. Throughout her life she was always creating in one way or another. 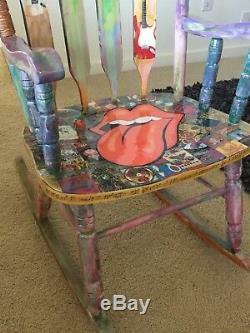 She most enjoys antique furniture to give new life through Decoupage, paint and embellishments. Michael has been an artist his entire life. 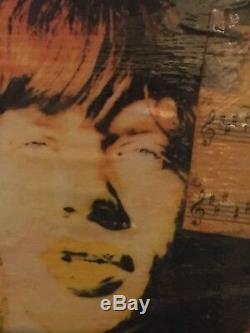 If you patted little Michael on the head and asked him what he wanted to be, it was always an artist. Although he studied and created steadily he has forged a career representing master art collections and promoting other artists. Their collection has been created with lots of love energy by two people who really love creating together. Every piece is custom made and one of a kind! YOU will be the only person to have any ONE of their pieces. Michael & Laura are up and coming, join our mailing list or follow us to be notified when new items become available. They also can be found easily by going to our store where they have their own category! 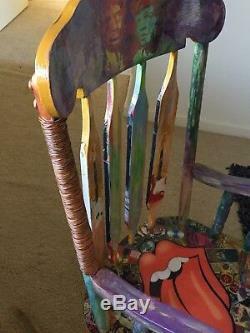 The item "Rolling Stones Rocker One of a Kind Rocking Chair L & M Seanart ORIGINAL ART" is in sale since Saturday, December 2, 2017. 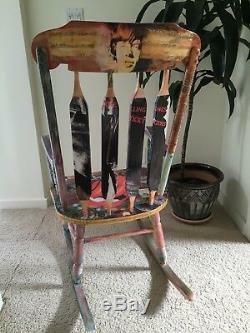 This item is in the category "Collectibles\Kitchen & Home\Furniture\Chairs". 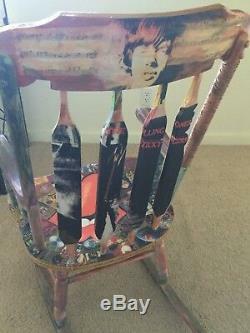 The seller is "beautifulthings2" and is located in El Segundo, California. This item can be shipped to United States.